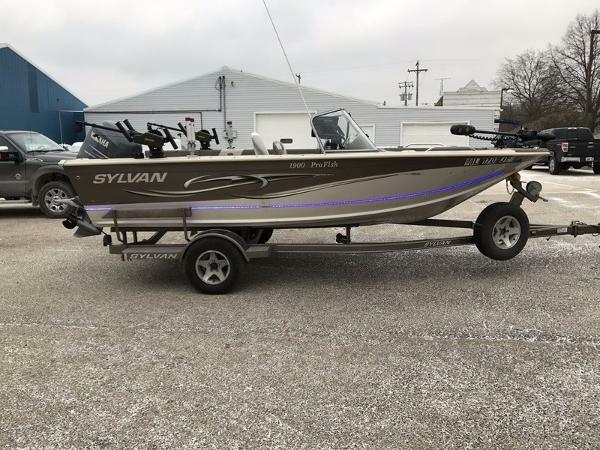 2005 Sylvan 1900 PRO FISH PRICE REDUCED! 2005 Sylvan 1900 Pro Fish This is a 2005 Sylvan 1900 Pro Fish that is powered by a Yamaha 150 #FI 4 Stroke. This boat is loaded up with the following options: Minn Kota 112 Ulterra iPilot Link with US2, Lowrance HDS 7 Gen 2 Touch at Bow, Humminbird 1199ci HD Side Imaging GPS/Fishfinder at Cosole, Fishhawk X4D Bluetooth Downrigger Monitoring System, 2 x Cannon Mag 15 Down Riggers with Swivel Base & Removable Mounts, 2 x Big Jon Heavy Duty 2 Pole Rod Holders with Removable Mounts, Hydraulic Steering, Sport Top with Side & Aft Curtains, 3 Bank Troller Battery Charger, 2 Bank Main Battery Charger, AM/FM/CD Player, Marine Radio, Battery Switch, Interior LED Lighting in Bow & Cockpit Areas, Exterior LED Lighting, Compass, and Custom Fit Travel Cover. The trailer is a Single Axle Bunk Trailer with Spare Tire, Load Guides, Swing Tongue, Surge Brakes, and Motor Tote.This boat has been fully checked thru by our service department and is ready to catch fish! The boat has some minor dock marks. This boat is loaded up with a lot of newer fishing equipment:Minn Kota 112 Ulterra iPilot Link Troller - Retails for $2,600, Fish Hawk X4D Bluetooth Downrigger Monitor - Retails for $800, Lowrance HDS 7 Gen 2 Touch - Retails for $1,000, Humminbird 1199 HD SI - Retails for $1,500.Fish Hawk X4D Bluetooth Description: You'll get trolling speed and water temperature at the lure, the true running depth of your downrigger weight, and surface temperature and speed, all key information for successful trolling. The Fish Hawk X4D uses Bluetooth® Smart wireless technology to send data to your mobile device(s) and the free Fish Hawk Mobile App turns your smart phone or tablet into an extra display anywhere in the boat. The app's Catch Log feature lets you quickly record the species, size, GPS coordinates, and probe depth, temp, and speed every time you catch a fish. The app also lets you quickly and easily share catch log information with fishing buddies in other boats via text or email.